Getting back to blogging after long is difficult indeed.The break was unintentional.I thought I could continue blogging despite the hectic work going on but I was wrong.I didn't have any drafts ready too so the blog suffered in the meantime.Diwali came and went without a single festive recipe here,sorry to disappoint all of you who came in to check the specials. Brinjal is one vegetable I share a love-hate relationship with.On the outset I'd say I dislike Brinjal but if cooked the right way with the right kind of spices,I don't mind having it.Amma makes a mean Brinjal upkari with Sambhar powder and this is my way of doing it. 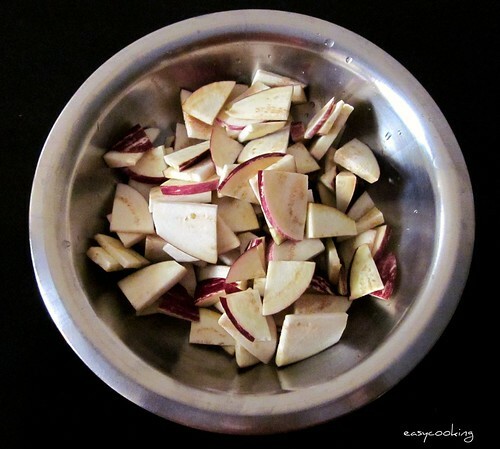 Drain the brinjal slices soaked in water and apply salt.Keep aside for a few minutes till you get everything else ready. Soak the tamarind extract and sambhar powder in hot water. In a kadai add oil and splutter mustard seeds and add curry leaves. Mix in the onions and saute till it starts turning golden brown. Add the sambhar powder-tamarind mix and the grated jaggery.Mix well. Squeeze the brinjal pieces well and mix in.Cover with a lid and cook for 5-7 minutes or till the brinjal is tender and cooked evenly. Welcome back Divya. Hope you had a great Diwali! I too make this Vaingana Upkari with some variation. Nice pics too! Stir fried brinjals looks fabulous and quite inviting.. Welcome back dear. Hope you had a great Diwali. 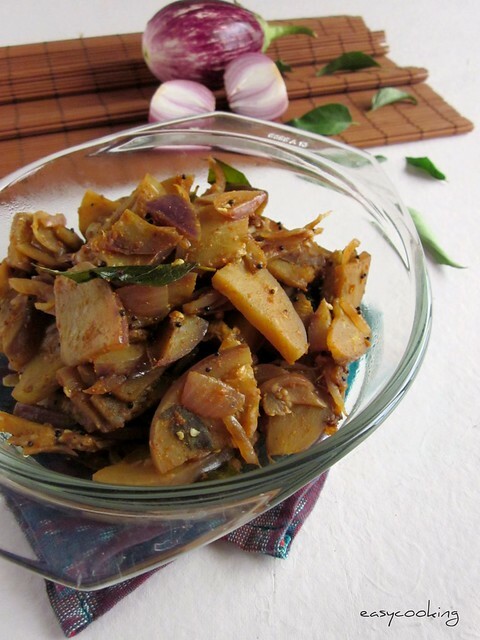 Loved this delicious brinjal recipe. This palya is very much of my kind simple yet very delicious. Happy Diwali (though belated)..Wish you the very best...Yes indeed, have been disappointed as you seemed to have vanished, and no diwali posts :(...ssoooo, now you need to make up to us...eagerly awaiting your lovely creations, and of course some lovely sweet recipies to compensate, what say ! Wow !!! this is new to me. Never tried adding sambhar powder and jaggery in stir fry. Looks very delicious. Bookmarked. I think the Diwali season saw a lot of us taking looong breaks from blogging! :) welcome back... beautiful recipe!